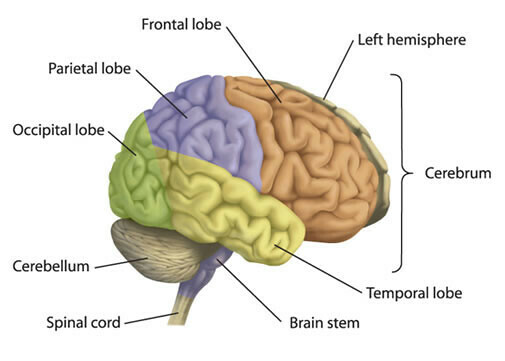 The frontal lobes are part of the Cerebral Cortex and are the largest of the brain's structures. They are the main site of soâ€“called 'higher' Cognitive functions. 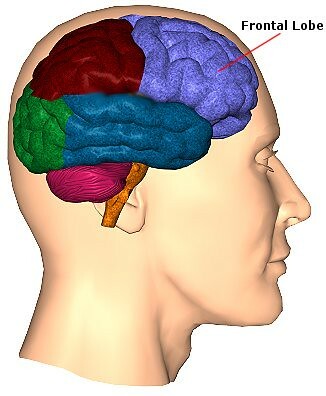 The frontal lobes contain a number of important substructures, including the prefrontal cortex, orbitofrontal cortex, motor and premotor cortices, and Broca's area. These substructures are involved in attention and thought, voluntary movement, decisionâ€“making, and language. Executive processes (voluntary behavior such as decision making, planning, problemâ€“solving, and thinking), voluntary motor control, cognition, intelligence, attention, language processing and comprehension, and many others. The frontals lobes are the brain's largest structures and consequently have been associated with a large number of disorders. These include ADHD, schizophrenia, and bipolar disorder (prefrontal cortex). The parietal cortex plays an important role in integrating information from different senses to build a coherent picture of the world. It integrates information from the Ventral visual pathways (which process what things are) and Dorsal visual pathways (which process where things are). This allows us to coordinate our movements in response to the objects in our environment. It contains a number of distinct reference maps of the body, near space, and distant space, which are constantly updated as we move and interact with the world. The parietal cortex processes attentional awareness of the environment, is involved in manipulating objects, and representing numbers. Sensory or motor neglect â€“ e.g. a person with right sided sensory neglect will not respond to a sound from the right, gesturing by someone standing on their right or a touch to the right side of the body. They will respond normally to these stimuli on the left side. 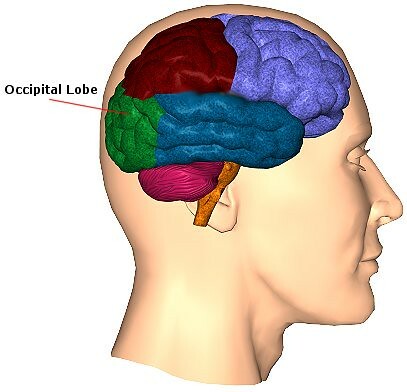 The occipital cortex is the primary visual area of the brain. It receives projections from the retina (via the thalamus) from where different groups of neurons separately encode different visual information such as color, orientation, and motion. Pathways from the occipital lobes reach the temporal and Parietal Lobes and are eventually processed consciously. Two important pathways of information originating in the occipital lobes are the dorsal and ventral streams. 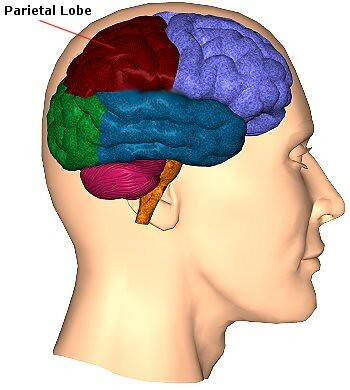 The dorsal stream projects to the parietal lobes and processes where objects are located. The ventral stream projects to structures in the temporal lobes and processes what objects are. This area is responsible for vision; symptoms include problems with or loss of vision on one side. Blindness that is caused by damage to the visual area of the brain is called â€˜centralâ€™ or â€˜corticalâ€™ blindness. The temporal lobes contain a large number of substructures, whose functions include perception, face recognition, object recognition, memory acquisition, understanding language, and emotional reactions. Damage to the temporal lobes can result in intriguing neurological deficits called agnosias, which refer to the inability to recognize specific categories (body parts, colors, faces, music, smells). Schizophrenia is the cognitive disorder most closely aligned to temporal lobe dysfunction. Fits â€“ these may be called â€˜temporal lobe Epilepsyâ€™ this type of epilepsy is often associated with weird feelings, smells or dÃ‰jÃ€ vu sensations which accompany or precede a fit. The cerebellum monitors and regulates motor behavior, particularly automatic movements. Some recent studies have associated the cerebellum with cognitive functions, such as learning and attention. Although the cerebellum accounts for roughly 10% of total brain weight, it contains more neurons than the rest of the brain combined. The cerebellum is also one of the few mammalian brain structures where adult neurogenesis (the development of new neurons) has been confirmed. The brain stem consists of a group of structures that lie Deep within the brain, including the Pons, medulla oblongata, and midbrain. It plays an important role in maintaining homeostasis by controlling autonomic functions such as breathing, heart rate, and blood pressure. While the brain stem can organize motor movements such as reflexes, it coordinates with the motor cortex and associated areas to contribute to fine movements of limbs and the face. Very few cognitive disorders have been associated with the brain stem. However, because so many nerves go through the brainstem, problems here can cause a wide range of symptoms.